i Click 'view all' to instantly compare this ok deal with offers on other top wall mount vacuums. 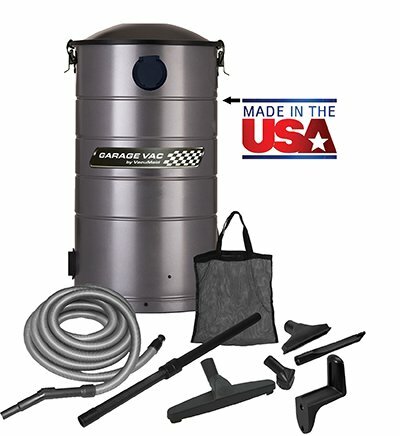 VacuMaid GV30 Wall Mounted Garage Vacuum & 30 ft Hose & Tools is currently selling at $249.00, which is its normal price. It has a lowest price of $249.00 and is selling within its usual range. Price volatility is 0.15% (meaning it does not change often), so you might have to wait a while for the price to drop. Until then this is a recommended 'ok deal'. The current deal is also the best price on this item over the last month. Compare the current price, savings (in dollars & percent) and Buy Ratings for the top Wall Mount Vacuums that are closely related to VacuMaid GV30 Wall Mounted Garage Vacuum & 30 ft Hose & Tools. Here is how VacuMaid GV30 Wall Mounted Garage Vacuum & 30 ft Hose & Tools compares with other leading Wall Mount Vacuums. 120 volt 5.1"Ametek Lamb motor - 12 Max AMPS - 95" Sealed Vacuum - 507 Max Air Watts - 400-450 hours of motor life - 30' Crush Proof Hose - Durable Plastic Telescopic and Curved Wands - 12" Floor Brush with Natural Bristles - Select Crevice Tool - Select Dusting Brush - Select Upholstery Nozzle - Hose Hanger - Convenient Storage Bag/Caddy. Includes one 7 gallon 5-layer HEPA-style bag with a fine particle filtration up to 99.98% (use part number VacuMaid HPB2H). Alternative 7 gallon 2-layer replacement paper bag with a fine particle filtration up to 98.4% may be purchased (use VacuMaid HPB1). This is a traditional vacuum cleaner allowing you to clean the garage, workshop, basement, or vehicles with the power and ease of a central vacuum. This unit is constructed out of rolled galvannealed steel and powder-coated for a tough, corrosion-resistant lifetime of use. It mounts quickly and easily to the wall with no plumbing necessary. Simply attach the hanger bracket to the stud, slide the unit onto the wall, plug it in and you are ready to clean. The exhaust will operate as a light blower for your shop or garage. This feature does not replace a leaf blower. Over 50 Years of Vacuum Innovation. The Garage Vac is Made in the USA by Lindsay Manufacturing, a manufacturer of central vacuums since 1956. THIS IS NOT INTENDED TO PICK UP LIQUID OF ANY KIND. 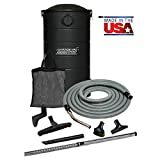 FeaturesIncludes 30' hose & hanger, caddy bag, telescopic wand, dusting brush, floor & crevice toolsEasy to change 7 gallon 5 layer HEPA style bag - No messy cans to empty or filters to clean.5.1" Ametek Lamb Motor for up to 25% more life than comparative brands.Powder-coated steel for corrosion resistant lifetime use. 5 yr residential warranty.